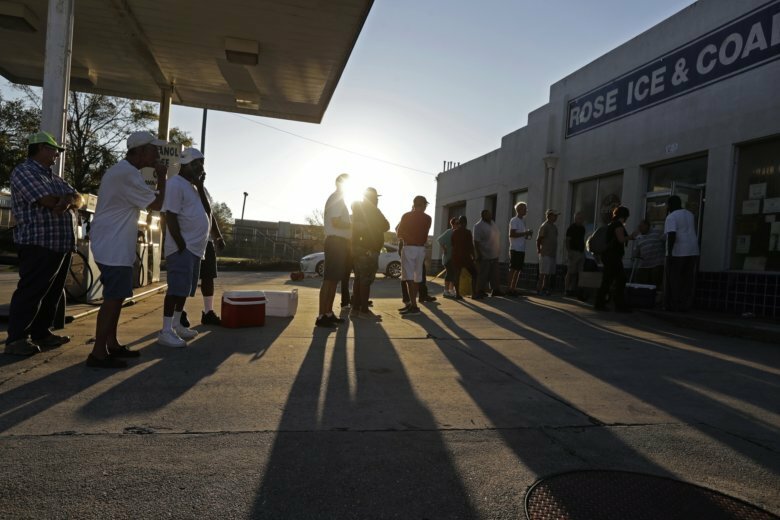 WILMINGTON, N.C. (AP) — The sun rises blazing hot over Wilmington, and the line for ice is shorter than it was the day before. The lines across town for tarps and bottled water have dwindled, as well, and Brian Gray takes that as a hopeful sign that desperation is giving way to something else. Hurricane Florence had marooned this place since it roared ashore last Friday morning. Wilmington and its 120,000 residents survived the horror of the storm — which snapped telephone poles and sent trees into bedrooms — to find that the roads leading into the port city were flooded, leaving it an island with almost no electricity that no one could get into or out of. Ice became their most precious commodity, traded like cash, and Gray, a handyman, took a temporary job hauling bags of it to cars that stretched for blocks for days. Now, finally, far fewer cars are waiting. Almost a week after the hurricane hit, several roads into town are accessible again. Gas stations and grocery stores are flipping closed signs to open. The backyard parties, where everyone grilled the food in their fridges before it could spoil, are mostly over. The wind and rain have stopped, though the smell of rot and mildew is settling in. It’s no longer about just getting through the day, but contemplating what’s happened to this community and what comes next. “I’m over not having power. The trash is starting to stink. The food in my refrigerator is starting to rot. I just want a nice warm shower,” says Gray. He had held it together, despite cuts inflicted from climbing trees to saw down limbs and even as he hauled all that ice to cars filled with distraught families. Then a little thing became too much: He couldn’t find his flashlight the other night and wandered through his pitch-black house for a half-hour, bumping into things and growing angry. Like most of her neighbors, Pat Coffman, an accountant, has not had electricity for six days, and the fear and isolation have morphed into fatigue. She spoils herself by watching television on her phone, which she’s constantly trying to charge. “I had to forget about all this stuff for a little while,” she says, stopping to pick up some ice from Gray before heading to her son’s neighborhood, where Florence uprooted trees and sent them shooting like missiles into homes. One bag of ice goes into the cooler of Renee Beccue. Beccue had been sleeping early Friday as the storm raged around her. Something woke her up around 6:30 a.m. She looked out the window and saw tree limbs flying through the air and the giant maple in her front yard bending. She got out of bed, wrangled her cats and decided to wait out the storm in the hallway. Not five minutes later, the maple tree came crashing in. The roof caved, dumping shingles and insulation and branches into the bed where moments before she’d been sleeping. Beccue gathered her shrieking cats and ran across the street to her neighbor’s house, where she has stayed ever since. If there is a silver lining to this, she says, it’s that her neighbors have been getting together and talking more than ever before. There’s little else to do once the sun goes down. The nation’s roiling political divisions don’t seem to matter all of a sudden. They are united in shared desolation. It’s hard for them all to sleep through the boiling hot nights, and they’re afraid of looting if they leave windows open; a Family Dollar in Wilmington was burglarized in the days after the storm. She puts things into perspective by reminding herself that at least 37 people have died in the storm. A mother and her infant were killed five miles away in exactly the same way that almost killed her. People who lost their homes to Hurricane Matthew in 2016 have lost their homes again. Hundreds have been rescued from their rooftops and cars. Babies have been swept away by floodwaters. Outside a still-shuttered restaurant in town, Ronnie Maness drops his cane and his backpack on a curb and sits down. A homeless Army veteran, Maness lived in a camp in the woods until Florence struck. He rode out the storm and the following days at his friend’s house, with no power and little food. Then his friend’s family returned home from evacuating, and he had to go. On Wednesday, he went to check on his camp in the woods. The wind took his tent, his clothes and everything else but the T-shirt, shorts and sneakers he was wearing. “I guess I’ll get me some cardboard and sleep on that,” Maness says. Downtown, a block back from the Cape Fear River, Eli Ellsworth reopened his bar Monday, using candlelight until the power finally came back on. The Barbary Coast is the oldest tavern in Wilmington, and “people need to feel normal,” says Ellsworth. “You’re doing the Lord’s work,” one regular says as he walks inside. People have seemed in good spirits, Ellsworth says, considering the circumstances. A local radio announcer acknowledges the situation before them: “Have a good, well, try to have an OK evening,” he says as he signs off. The sun starts to set, and Fatima Sail rolls her 2-year-old son, Skyler, along the boardwalk, up to the river’s edge. She got back into town Tuesday night, as soon as some roads opened. They had evacuated to Georgia, where they spent a week agonizing over what might have happened to their home and their neighborhood, with no way to get back into the city to check. They found their house intact, so Sail made her way Wednesday evening to the river. “I missed it,” she says. She brings her son here every night to eat ice cream and watch the water roll by. Though higher, the river still looks peaceful, she thinks. It’s hard to believe this is the same river that swelled into a fearsome killer, sending families for a mile on either side of its banks fleeing their homes, terrorizing her state for days.